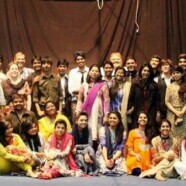 CLP presented the annual play of Sham-e-Calvary on 27March 2015 in Sinclair Hall in remembrance of the Resurrection Day of our LORD Jesus Christ. The theme of Salvation was presented through a play and worship songs prepared by the students of CLP. Hymns were presented in the first half of the event. In the second half a powerful message of faith and hope was delivered by the play. The event as whole was a great source of blessings for all present and for bringing many souls together in Christ.